It isn’t everyday that you here of ports and other hacking feats like you heard back in the day when iOS was more easily hacked, as such todays news is special. Winocm has just announced on his blog that he has been able to port iOS to non-Apple devices. 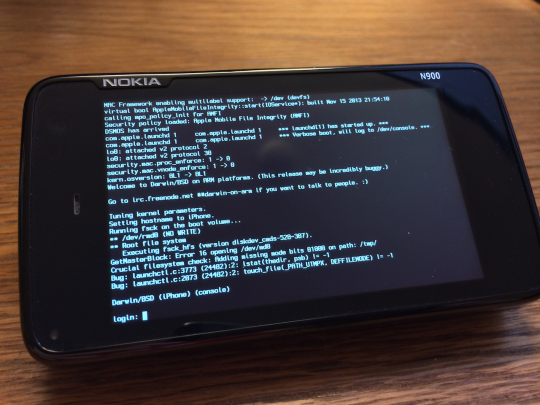 In the photo you can see below it depicts the iOS core, also known as XNU Kernel, running on a Nokia N900 smartphone. For those of you who don’t know Winocm is one of the lead developers on the iOS 6.1.3/4 Untethered Jailbreak. At its current stage the port of the iOS Kernel is extremely primitive and doesn’t include any user interface elements, but it is very impressive none the less and is a sign of great progress. “Reecently, I achieved one of the core milestones of my personal project, porting the Darwin kernel to the ARM architecture. This specified milestone was booting to a multiuser system. So where will this all lead to? At the moment it is hard to say because every iOS port in existence has never really seen the light of day. If Winocm was to complete the project, however, it could be possible to run fully-fledged iOS on other devices. At the moment though this port is essentially a minimal variant of iOS with no user-interface for non-Apple hardware… in other words it is only useful for developers. You can check out the project over at GitHub.